'Maut ka Kuan' is a very popular entertainment act in most of the Indian Fairs. As the name suggests, it is very dangerous but the folks who do it are very skilled. The stunt is performed in a well-like structure made up of wooden blocks. The spectators stand around the wall of the well and look down into it. 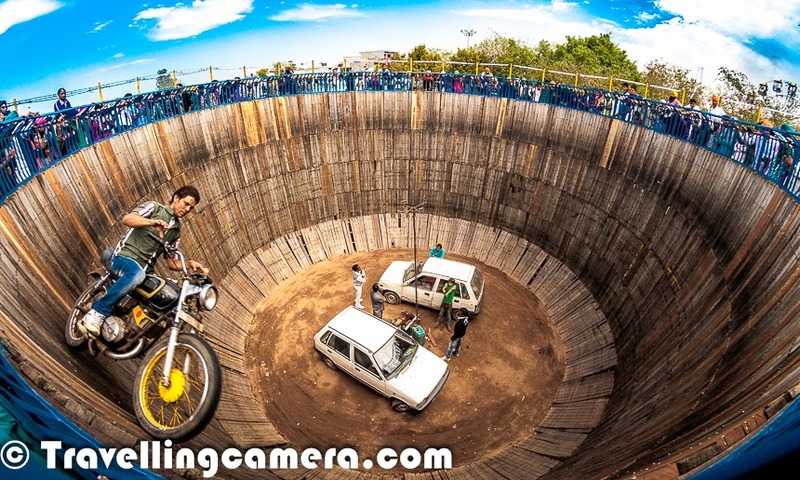 At the bottom of the well, one can usually see a couple of cars and motorcycles standing stationary. Then one-by-one, the stuntsmen start driving these vehicles on the wall of this circular well. For a considerable period of time, each vehicle is moving at a very high speed, parallel to the ground. They often reach the top of the well. At times, spectators hold out some money to them, and these drivers almost always manage to grab this money in spite of the speed, in spite of the dangerous angle they are driving at. After some time, all of these vehicles start driving simultaneously. And at this point the well starts shaking, which is a very scary experience. As you can see, the spectators stand around the wall of the well, at a great distance from the ground. I remember my first experience of 'Maut ka Kuan', when I was 12 years old. After a while I closed my eye and tightly hugged my dad, till the point the show stopped. Recently I have been meeting folks who earn their living from 'Maut ka Kuan' shows to know about their point of views about this stunt. I am still learning about their lifestyle and how they learn these skills. A detailed Photo Journey with specific facts will be shared soon. Yes indeed its very scary and I too first saw "Maut ka kuaa" show when I was 8 or 9 years old..BTW did you click this pic? Shilpi - yes, this was shot during Hola Mohalla this year. Amazing click man, I recollect memories from childhood going to visit this particular stunt! Thanks for appreciating the click Jatin ! Awesome stuff! What was the name of the group performing?